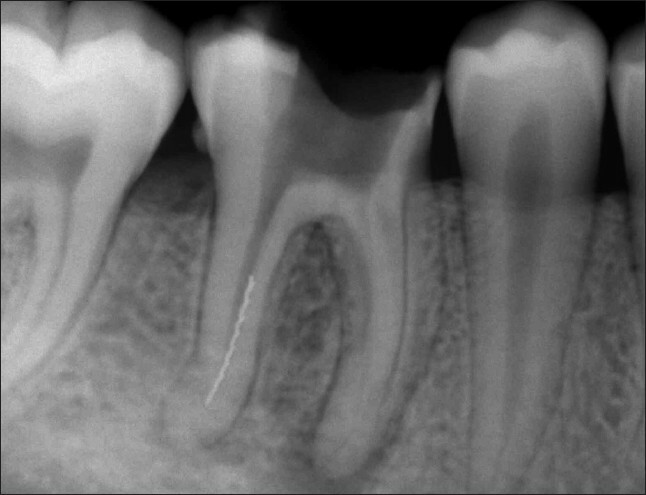 Intracanal separation of endodontic instruments may hinder cleaning and shaping procedures within the root canal system. Its incidence ranges from 2% to 6% of the cases investigated. The clinical outcome of the cases with fractured instruments depends on several factors such as: the position of the instrument in the canal, type of material, instrument size and canal anatomy. Failure in retrieval of the fractured instrument does not automatically result in failure of the case. The difficulty in the retrieval of these instruments ranges from surprisingly easy to downright impossible. While methods for obstruction bypass have been described, there are times when bypass is not possible or when complete removal of an obstruction is preferable to bypass. An attempt to bypass or retrieve the instrument should be made before leaving it and obturating the canal system. This clinical case describes the usage of IRS for retrieval of separated instrument from distal root of mandibular first molar. 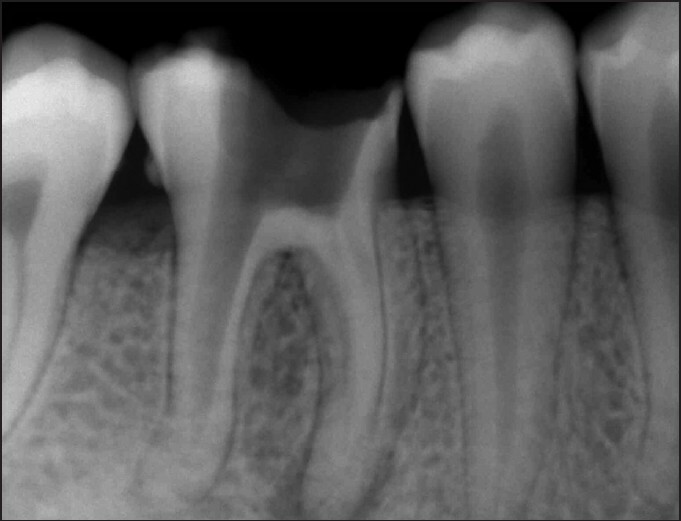 This was a case report of a 35-year-old male patient who was referred to the Department of Conservative Dentistry and Endodontics with the complaint of pain in the lower right posterior region for past 45 days and also he gave a history of root canal treatment of tooth number 36 1 month back in a private clinic. On clinical examination, the canals were found un-obturated. On inserting a file, an obstruction was encountered in the middle of the canal of distal root. A diagnostic radiograph was made, which revealed the presence of a separated instrument extending from middle to apical third of canal [Figure 1]. Since the efforts of bypassing the fragment went futile an attempt to retrieve it was made with ethylenediamene tetraacetic acid and H-file technique that proved unsuccessful. 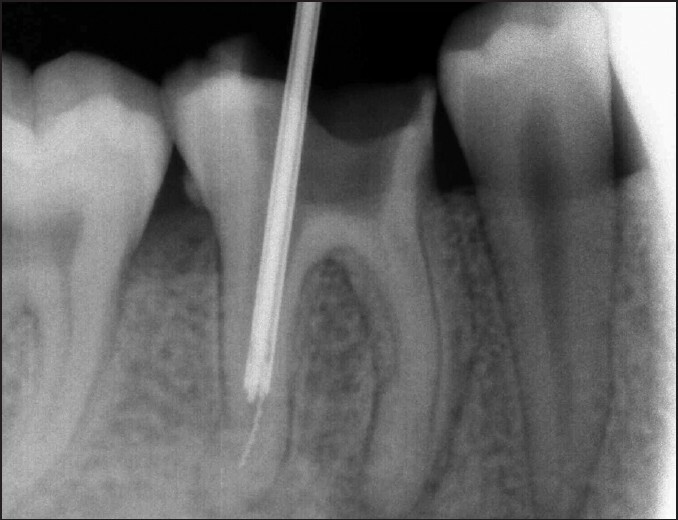 Hence, retrieval was planned using instrument removal system (IRS) The radicular straight line access to the coronal end of the fragment was obtained by funneling the root canal with sequential use of modified gates glidden drills #1 and #2 sectioned at their maximum cross-sectional to obtain a flat end [Figure 2]. IRS system was then employed for retrieval. Microtube of the IRS system was inserted into the canal with the long part of its beveled end oriented to the outer wall of the canal to "scoop up" the head of the separated instrument and guide it into the microtube [Figure 3]. Success in guiding the head of the separated instrument into the microtude could be achieved after few attempts [Figure 4]. Same color-coded screw wedge was then inserted and slided internally through the microtube's length until it contacted the separated instrument. The separated instrument was engaged by gently turning the screw wedge handle counterclockwise. A few degrees of rotation served to tighten, wedge and often displace the head of the separated instrument through the microtube window [Figure 5]. The separated instrument was removed by rotating the microtube and screw wedge assembly out of the canal in counterclockwise [Figure 6]. The microtube and the screw wedge were taken out of the canal along with the separated instrument [Figure 7] and [Figure 8]. Radiographs were taken sequentially to confirm the position of the microtube and also to make sure that finally the canal was cleared of obstruction [Figure 9]. Working length radiograph was then taken and the canals were prepared and obturated with gutta-percha using thermoplastic obturation technique. 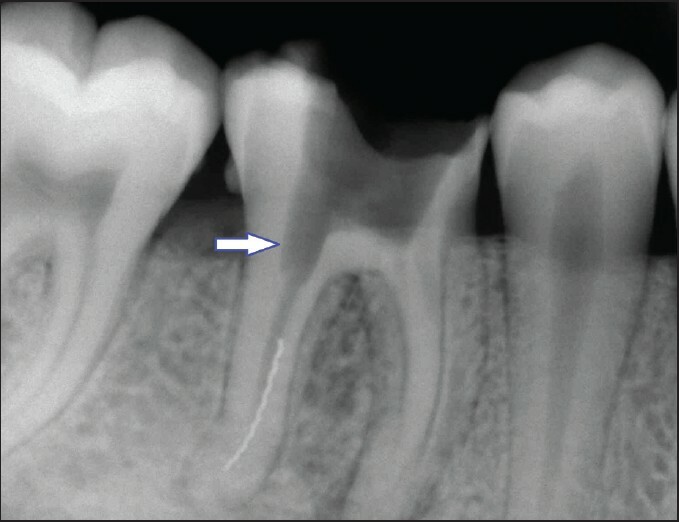 Separation of instruments in the canal during endodontic treatment may block access to the apical terminus. Intracanal separation of instruments usually prevents access to the apex, which impedes thorough cleaning and shaping of the root canal and thus may compromise with the outcome of endodontic treatment and reduce the chances of successful treatment. The common causes for file separation are improper use, limitations in physical properties, inadequate access, root canal anatomy and possibly manufacturing defects. The most ideal management of separated instruments is to prevent the occurrence in the first place. 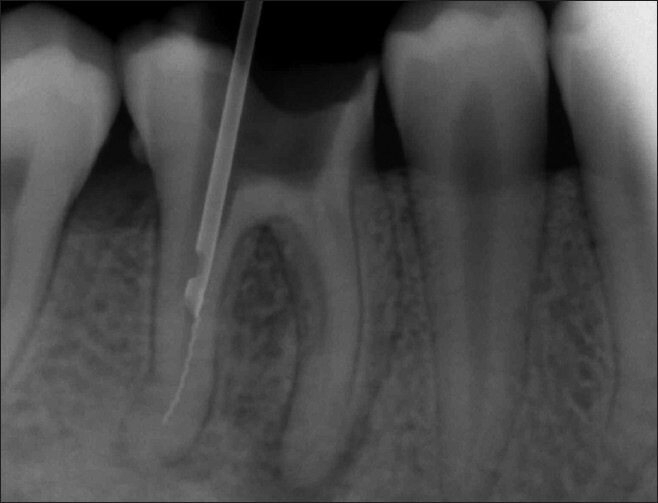 Adhering to proven concepts, integrating best strategies and utilizing safe techniques during the root canal preparation procedures will virtually eliminate the broken instrument procedural accident. Prevention may also be greatly facilitated by thinking of negotiating and shaping instruments as disposable items. Simply discarding all instruments after the completion of each endodontic case will reduce breakage, lost clinical time and upsets. However, on occasion an instrument will break and in spite of the best existing technologies and techniques the broken file segment may not be able to be bypassed or retrieved. One of the most important factors to be considered prior to instrument retrieval by this system is to obtain a straight line access to the coronal end of the separated instrument by the use of modified gates glidden drills, #1 and #2 sectioned at their maximum cross-sectional to obtain a flat end. The objective here is to create a straight line access to the coronal aspect of the separated fragment. However, this leads to removal of a considerable amount of radicular dentin and can cause iatrogenic damage like perforation. Close inspection of pre-operative radiographs and knowledge of root anatomy is imperative before attempting the removal procedure in any tooth to ascertain the relative amount of surrounding dentin and the risk of perforation. File removal generally results in ledge formation and therefore a possible stress concentration point. When the file is located in the middle or apical third of the root, removal procedure significantly reduces the root strength. 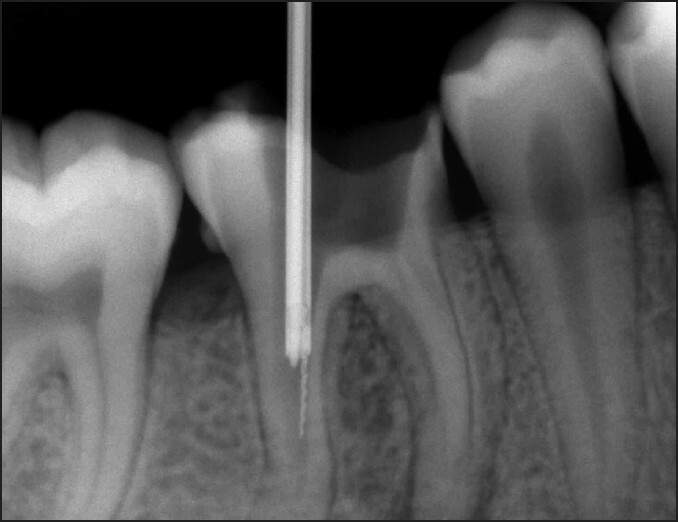 This case report attempt to address and report conventional techniques must be tried before but if they prove to be unsuccessful alternative devices should be used for the removal of broken endodontic instruments. For the successful working of the IRS system, straight-line coronal and radicular access is required to expose and subsequently visualize the coronal-most end of the broken instrument. This leads to removal of a considerable amount of radicular dentin and thus weakens the root structure. 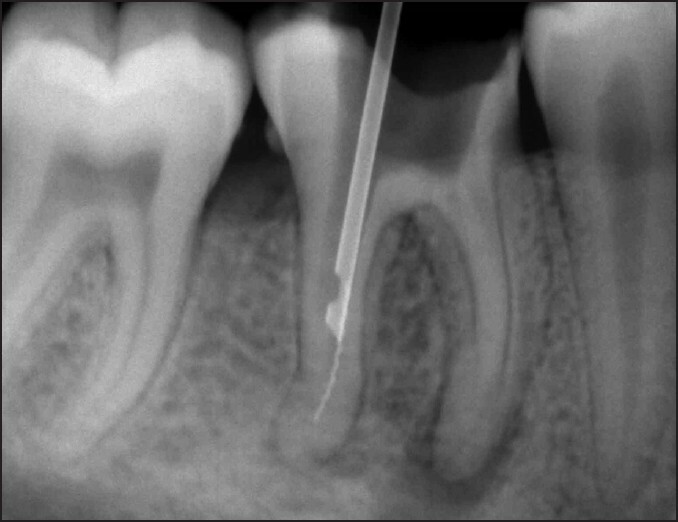 Nonetheless, the case may be described as a success if one considers the perfect seal of the root canal system and a failure if one considers the amount of dentin lost in the retrieval process. 1. D'Arcangelo C, Varvara G, De Fazio P. Broken instrument removal - Two cases. J Endod 2000;26:368-70. 2. Roda RS, Gentleman BH. Nonsurgical retreatment. In: Cohen S, Burns RC, editors. Pathways of the Pulp. 9 th ed. St. Louis: CV Mosby; 2006. p. 982-90. 3. Ruddle CJ. Cleaning and shaping root canal systems. In: Cohen S, Burns RC, editors. Pathways of the Pulp. 8 th ed. St. Louis, Mo: Mosby; 2001. p. 231-91. 4. Fors UG, Berg JO. Endodontic treatment of root canals obstructed by foreign objects. Int Endod J 1986;19:2-10. 5. Nagai O, Tani N, Kayaba Y, Kodama S, Osada T. Ultrasonic removal of broken instruments in root canals. Int Endod J 1986;19:298-304. 6. Hülsmann M. Removal of fractured instruments using a combined automated/ultrasonic technique. J Endod 1994;20:144-7. 7. Masserann J. The extraction of posts broken deeply in the roots. Actual Odontostomatol (Paris) 1966;75:329-42. 8. Ruddle CJ. Nonsurgical endodontic retreatment. In: Cohen S, Burns RC, editors. Pathways of the Pulp. 8 th ed. St Louis, Mo: Mosby; 2001. p. 875-929. 9. Ruddle CJ. A review of Ruddle on retreatment [videotape]. Santa Barbara, California: Advanced Endodontics; 2000. 10. Souter NJ, Messer HH. Complications associated with fractured file removal using an ultrasonic technique. J Endod 2005;31:450-2.